I am so excited that I could bust! This is the kids’ last week of school and summer is so close I can taste it. Almost three months with all my chickadees back under my wings. Some of you don’t share my excitement. You’ve already enrolled your children in every VBS and camp in the area desperate to keep the children entertained – and busy. But it is the lack of busyness that I am looking forward to. It is the time for us to slow down and focus on character issues and academic goals, grow in our relationship with God, and make memories as a family, all while allowing our four children to be kids and play. All things that are very difficult to do when we are hurrying from one activity to another. In order for this to happen, I realize I need some guidance. I need to set goals and lightly structure our day. Thinking about what God has called me to do as a mom and bringing to light the struggles we are having, the Holy Spirit led me to this verse. I love how this verse brings out four areas of focus. Because our children are older now, I believe it very important to gather their input in creating goals for the summer. Using this verse as a guide, we discussed as a family what we want to focus on this summer and in using the verse the kids saw that these are four areas we all need to work on (even Mommy and Daddy). Below is the first draft that we created. 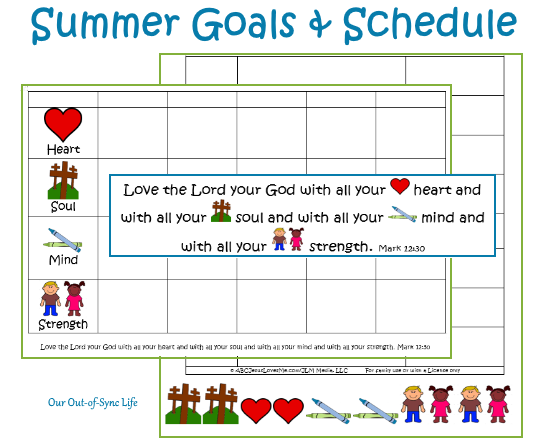 Click to print a blank Summer Goals template for create a goal sheet for yourself. Then using these goals, let’s create a summer schedule. While times are listed in this schedule, these are simply a guide to help us cover what the four areas of the verse. It is not regiment and can be changed within a moment’s notice. Also our kiddos arise very early so adjust the times as needed to fit your family. My goal for this summer is to help the older kids begin journaling during their personal devotions. This will consist of writing or drawing one thing they learned and copying (drawing) a verse. The older kids will use the Our Daily Bread for Kids Devotional as their guide. Peanut will look at his favorite Children’s Bibles. During breakfast the kids will share what they learned in their Devotions. Then they will work on the specific jobs that they do each day. Contributions include making bed, cleaning room, cleaning bathroom, picking up toys, laundry, as well as kitchen and garden help. See more ideas here. Each child will have specific academic areas to focus on. The learning will occur through books, worksheets, activities, Earobics or other free educational computer games. Peanut will finish the ABCJLM 5 Year Curriculum. Disclaimer: After nine months in school kids need a break. Thus, the learning we do during the summer will be specific to topics each child enjoys and will be much less than a typical school day. We will use this time to create 4H crafts for the fair and other creative learning, and practice musical instruments. Because we are working on showing kindness and compassion to siblings, some activities will be done in teams. The kiddos will take turns assisting in lunch prep and setting the table. All will participate in clean up. they may listen to Adventures in Odyssey or books on tape while they do crafts, play with Legos, or draw. Below is a rough draft of our daily schedule. Click to print a blank Summer Schedule template for yourself. 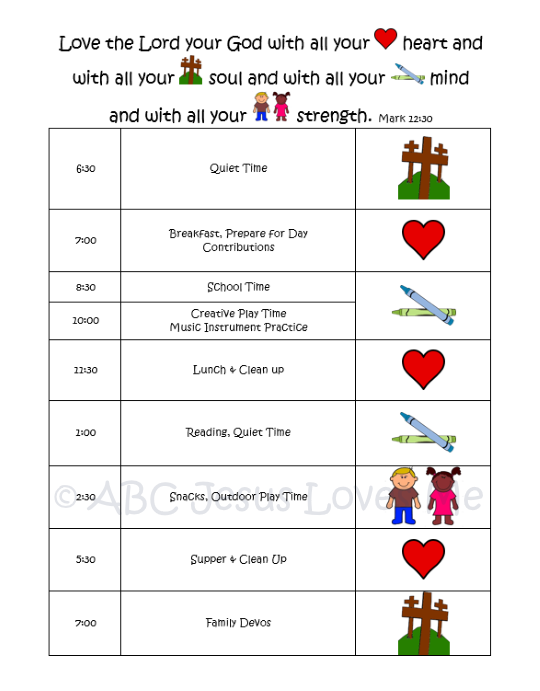 Develop your own schedule and then cut out the images at the bottom of the free printable and glue into the appropriate squares in the right-hand column. 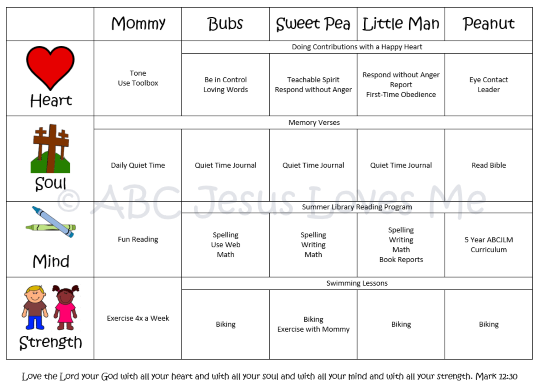 For more ideas, check out the summer schedule that I shared a couple of years ago. Most agree that making Mark 12:30 and Ephesians 4:31-32 the goal for this summer is a great plan. But the goal won’t come to fruition without time and intentionality. This is why busyness is not my hope for the next three months. I am asking the Holy Spirit to help me say “no” to the good things so that we can focus on the best. August so be sure to join me! Previous Post: « Who Are You Looking At?